The HyperX Pulsefire Surge RGB gaming mouse has great looks, accurate sensors and lights you can customize to suite your own personal style. It goes hand-in-hand with some other great gaming products they have, like their excellent Alloy Elite Keyboard. The subtle lines remind me of the video warrior's helmets in the original Tron film. And when it lights up, it turns into a light cycle, ready to de-rez opponents on the grid. I like it. I like it a lot, especially since I'm a big fan of Tron. To me, the main attraction of this mouse is the "Wow!" factor of custom lighting and macros. 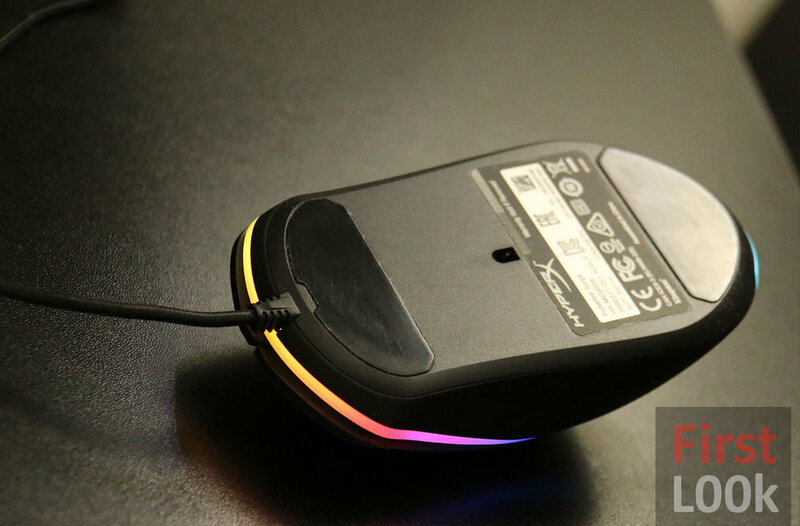 There is a ring around the base of the mouse, a full 360 degree connected circle with RGB capable lighting effects. And it's not simply one or two colors - it's the whole spectrum! Initial usage defaults into a moving rainbow of colors, letting you know the signature of this particular mouse (compared to its siblings). And while you might be loving this display of awesomeness, you might also be thinking it's too 'loud' - at least in public. Thankfully, HyperX gives us a couple of options to tone it down or turn it off. 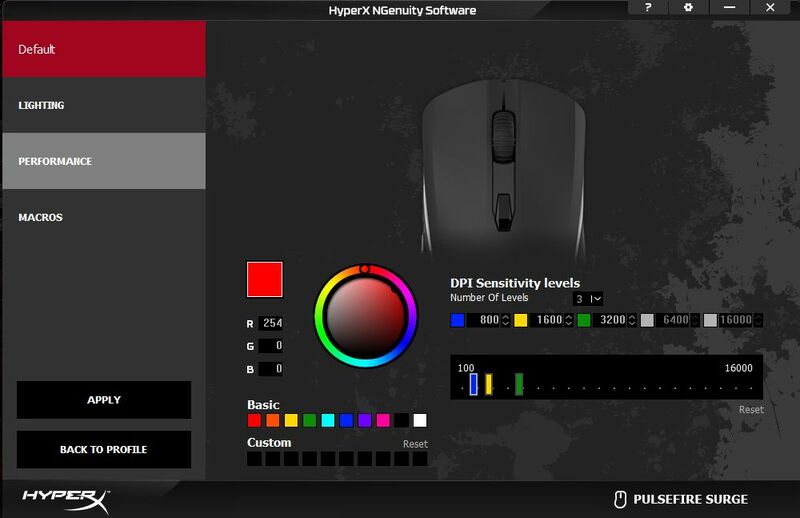 To turn it down even more, hold DPI and scrollwheel one more time and you'll have a solid red, HyperX color. And there you go. Three options offered to you as default lighting. If that's not enough (or you just want to blind your neighboring gamer), you can set brightness levels to high or just turn it off by again holding DPI and clicking either "previous" or "next". How's that for a start? Like most mice, the Pulsefire Surge RGB has the 3 basic left, right and middle scroll buttons. Omron switches were selected for them ensuring longevity and reliability when you consider they're rated for 50 million clicks. There's one thing of note about the buttons during high pressure gameplay however. There seems to be the slightest hint of delay between the time you push your finger into the mouse button to when you feel the responding "click." This "airiness" is barely noticeable and most people won't have the foggiest clue what I'm on about. But if you've got a fast, trained (and I do mean trained - as in many hours a day) trigger finger, you may notice a difference should you have the need to react extremely quickly. Sitting directly behind left/right/middle mouse buttons is the DPI button with 3 initial factory settings for 800, 1600 and 3200 DPI. Let me tell you, that DPI button has saved me a ton of aggravation from having to constantly open up the mouse settings. It's especially true for folks who play games requiring precision, like snipers in First Person Shooters. For the technophiles, the mouse utilizes the Pixart 3389 sensor, an excellent performer with a max native DPI of 16,000. In reality, nobody in their right minds would use such a high DPI for most tasks (to my knowledge, competitive e-sports players set theirs to somewhere between 400 and 1600), but having said that, the sensor is sensitive enough to track at such extremes if you needed it to. Once you're done playing, the lower DPI settings for these games are a bit impractical for real world day-to-day tasks. So having this one button saves you time - every time you play. Finally, the last two buttons are located near your thumb for "previous" and "next" functions. They, for some reason, require different pressure to click, possibly due to the difference in button size. But the smaller of the two requires what feels like double the force, which isn't very comfortable. The Pulsefire Surge RGB feels good in the hand with your fingers finding a nice, natural place to grip (thanks to an inner curve on the left and right sides.) But what really makes this mouse stand out to me is how HyperX designers integrated different materials in something that looks deceptively simple. You couldn't tell by looking at it, but when you put your hand on the mouse, you'll feel different textures all over. The left and right sides are made of a rubber and plastic composite that offers grip, while the top area that encompass the buttons and the palm are of a smoother plastic. They look the same, but serve different purposes - with neither inviting fingerprints. The secondary buttons (prev/next/dpi) are a clear plastic to help you quickly differentiate by feel, while the scroll wheel is totally rubber. From a design perspective then, this mouse is elegantly thought out. Rather than stick rubber pieces where your thumb and pinky fingers should be and call it a day, HyperX has balanced beautiful design with proper functionality. Compared to other mice I'ved used, it feels made for medium sized hands and has a good amount of weight. It's got huge skates on the bottom that allow the mouse to glide around any surface, but has the weight acting as a counterbalance. Case in point, if you tap the mouse on the side, the weight won't allow it to slide too far away. It feels like marriage - the skates want to move around and do this and that, but the weight keeps it from doing too much too fast. Depends on who's wearing the trousers in this marriage, you could say. What would have been a really nice addition is the ability to control the amount of weight. A heavy handed husband (or a wife for that matter) can eventually lead to divorce. But hey, for the price you're paying, I'd say HyperX has found a nice compromise. Now here's a bit of fun. If you enjoy customizing things, the Pulsefire Surge RGB will give you an endless variety of options. You start this by downloading the NGenuity software from the HyperX website. Set up almost any kind of lighting effect you could ever want. If you're unsure of how to start, HyperX offers some ready-made color profiles to get you started, including color schemes from Overwatch, PUBG and DotA2 to name a few. As you become more familiar with the software, you can pick and choose between different effects or design something manually all on your own. This section deals with your favorite DPI settings. Straight from the factory, the mouse has a default of 3 settings at 800/1600/3200 DPI. You can increase this to a total of 5 settings and set them to whatever DPI's you want in whatever order. DPI settings - store up to 5! You can assign any mouse button to do whatever function you want. And in case the function isn't available, the NGenuity software allows you to record and set your own actions and save them as macros before you set them as a function. When you're done with all of your customizations, you can enable it by saving the profile and selecting it before clicking "APPLY." Your mouse will now function with all the new settings you just created. If you remember from the beginning of this article about the 3 lighting options you can select, you can now replace one or all of the default settings with your customized creations. You simply drag your custom profile over one of the existing three (Wave, Cycle, Solid) and the setting will be stored on the onboard memory. If you ever encounter problems with the Pulsefire Surge RGB, you can try and reset to original factory settings by holding the DPI and the middle scroll button for 10 seconds. 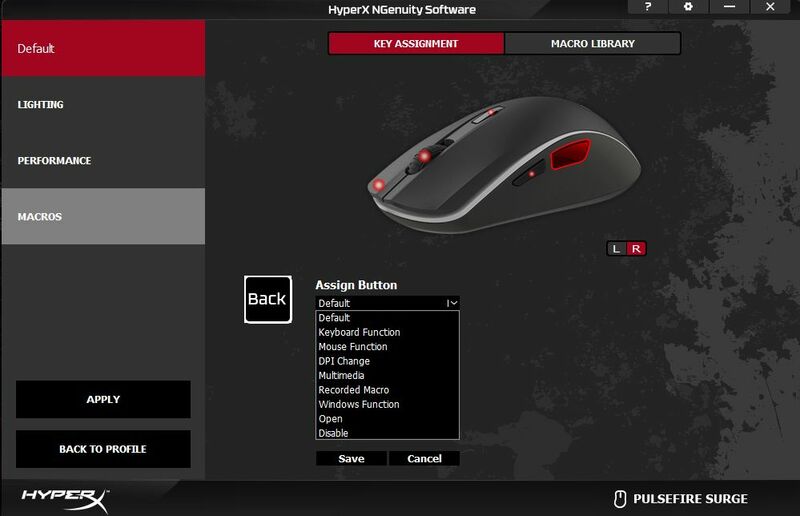 The NGenuity software also updates firmware on select HyperX products. Once it starts up and recognizes the peripherals, it'll check for version numbers and ask if you'd like to update to newer firmware (should it be available.) After that, you'll only be downloading firmware updates and not the entire NGenuity program, saving you time and data usage. That grip on the scroll wheel! The HyperX Pulsefire Surge RGB mouse is two thumbs up. The main buttons work nicely, the middle scroll wheel is grippy, textured and scrolls with nice, uniform ticks. The sensor is one of the best in the business, the cable is a heavy duty braided weave. It's got great lighting-display settings and software for customization is downloadable should you want. And granted, it's not perfect. But even with all that, it's carefully balanced for performance/design and an excellent bargain for the price. Yes, I think what we have here is a pretty great mouse.